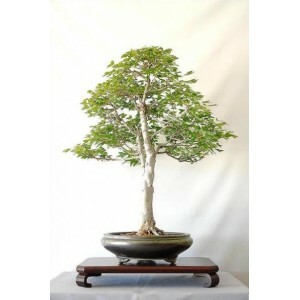 Trident maple is a traditional subject for bonsai. It is native of Eastern China and Japan. If left to grow naturally, it reaches 30 to 45 feet tall. Thick and strong trunk with interesting brown peeling bark that changes with age and exfoliates, revealing gray, orange-brown colors. Branches are refined. It is a tree that gains a mature appearance rather quickly. Fast growth.Upright deciduous tree with rounded crown. It has beautiful tri-lobed leaves, dark-green above and blue-green underneath, turning beautiful shades of orange and red in Autumn. The flowers are bright yellow and showy in the Spring. Hardiness zones 5-8, (-10°C/15°F, -26°C/-15°F) in Winter. A standard potting soil is recommended. It should provide for excellent drainage. They prefer a moist, but not soggy soil. Keep the soil somewhat dryer during the Winter months to minimize frost damage to roots. The Trident Maple's roots have a high moisture content, and are susceptible to frost damage. Easy maintenance, once established, they have a tolerance to dry soil, pruning and air pollution. Requires semi-shade in Summer, full sun the rest of the year. Germination For faster germination, soak the seeds in slightly hot water for 24-48 hours, followed by 3 months cold stratification before sowing in sterile gardening soil. Keep damp soil, not soaking wet. Keep pot in warm situation 20°C/68°F, 24°C/75°F. Germination can take several months. It can be more depending on their degree of unbroken dormancy, don't give up. Cold stratification This will break their dormancy. It creates a cold and moist environment for the seeds. Mixed in seeds with slightly moistened vermiculite or peat, only damp in a ziplock bag. Close zip bag shut and store it in the salad crisper compartment of your refrigerator. If any seeds begin to sprout during the cold stratification, simply remove the seed and plant.